MISSISSAUGA, ON, Sept. 13, 2012 /CNW/ - Sarah Slingsby wishes she could properly see the 3D movie that will be on the Cineplex screens after her new one minute public service commercial. Her eyes will not be able to focus together for her to watch Finding Nemo 3D® because of her retinoblastoma - an eye cancer - and other complications with her sight. Thousands of children, though not because of eye cancer, will also have the same problem as Sarah and their parents may not even know it. Sarah, now eleven, and her mother Leslie have teamed up with the Eye See…Eye Learn® program and the Ontario Association of Optometrists (OAO) to help raise awareness of the importance of children having comprehensive eye exams before they begin school. The OAO is running a one minute commercial on selected Cineplex screens in Ontario to share Sarah's story. Sarah was diagnosed with a potentially life-threatening retinoblastoma by her Mississauga optometrist. Sarah's mom took her for a routine eye exam at age eight after her optometrist recommended she have one. Leslie had no warning signs that anything was wrong. Sarah thought she was seeing "normal". "I was in shock when Dr. Chan told me the news. I didn't even think she had a vision problem, let alone cancer," says Leslie. "Her optometrist probably saved her life. Fortunately in Sarah's case she has a slow growing tumour. Retinoblastoma, though rare, is normally found in infants and toddlers. 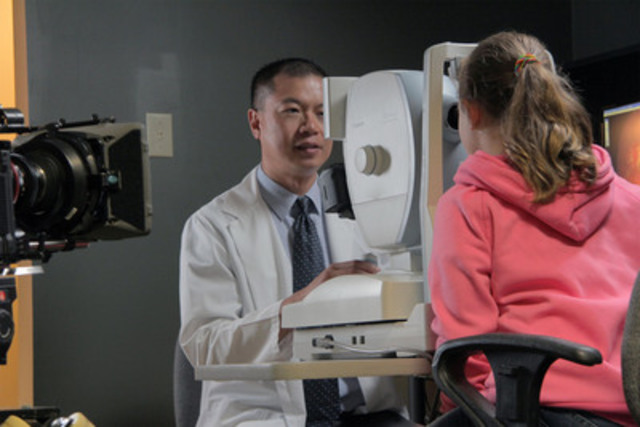 "We want parents to make a comprehensive eye exam by an optometrist an automatic part of a child's overall readiness for school, just like dental check ups and immunizations," says Dr Chan. "Though the likelihood of cancer is rare, optometrists diagnose thousands of cases of undetected vision problems and other sight threatening conditions such as ambloypia or 'lazy eye' every day." Unfortunately annual statistics have shown that 75 per cent of children between the ages of five and nine have not had their eyes examined by a Doctor of Optometry and a staggering 93 per cent of all children under the age of five have never been tested; despite the fact that annual eye examinations are covered by OHIP for children 19 years of age and under. To encourage more families to have their children's eyes examined, the OAO has partnered with the Ontario Government on the Eye See…Eye Learn® program. Currently Junior Kindergarten children in nine Ontario school regions are eligible to participate in the free program that encourages parents to book a comprehensive eye exam with a participating Doctor of Optometry for their JK child. If the child requires glasses, they will receive a pair of high quality, impact resistant and UV protected glasses free of charge courtesy of ESEL partners Jungle Eyewear® and Hoya Vision Care. The program is expanding across the province over the next four years. Sarah's Story will be aired just ahead of family rated movies in Cineplex owned theatres in Ancaster, Milton, Niagara, Sarnia, and Thunder Bay. To watch Sarah's story or learn more about the Eye See…Eye Learn® program, visit www.EyeSeeEyeLearn.ca or call toll free (855) 424-ESEL (3735) for more information. Doctors of Optometry are university educated and clinically trained to diagnose and treat disorders of the eye and visual system. They provide primary eye care services in the province of Ontario. Founded in 1909, OAO is the voluntary professional organization that represents more than 1,500 optometrists in Ontario.